The number of accidents for seniors in the winter dramatically increases, especially in parts of the country where snow and ice are prevalent. We asked our Nurse Gina for tips and safety precautions we can share to help you, or someone you know, prepare for the next few months of winter. Clear off sidewalks, porches and driveways: This may seem like common sense, but we know that people will venture out to retrieve the newspaper or pick up the mail without clearing a safe path. This can be a dangerous mistake. 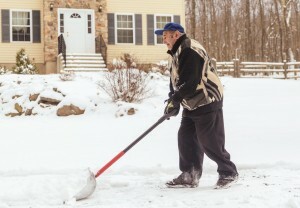 If you are unable to clear your sidewalk and driveway, hire a service, or ask a neighbor to help you. Dress for warmth and get good shoes: More than half of hypothermia-related deaths are of people over the age of 65*. When you’re indoors, wear layers. When heading outdoors wear warm socks, a heavy coat, a warm hat, gloves and a scarf. Don’t forget about your shoes. Invest in shoes with good traction and non-skid soles. Stay home: If the weather is questionable, stay at home. Unless it is an emergency, you would be wiser to stay in where it is safe and warm than having to take 2-3 months off to recover from a broken leg. Plan ahead: Watch the weather report on your local news and if they are reporting stormy weather, get organized. Go out before the storm and stock up on any essentials you may need or want. Pick up any medications you might need for a few days, if you’re unable to get outside. Charge up your mobile devices. Check your flashlights and make sure you have a battery-powered radio in case the power goes out. Prevent Carbon Monoxide Poisoning: When the outside turns cold and we start to use our fireplace, gas heater or lanterns, we need remember that these devices can lead to carbon monoxide poisoning. To ensure your safety, check the batteries on your carbon monoxide detector. Get Your Car checked Out: Many seniors drive slower and better than their younger counterparts, but they may not have quick defensive driving skills, especially in the winter. Make sure the vehicle being driven is equipped for snowy conditions. The best recommendation is to take your vehicle to a trusted tire/repair center and have them do a full “winter proofing” of your car to make sure everything is working like it should and that your tires are set for the worst conditions the winter months may bring. Winter months can certainly pose challenges for seniors, but by getting prepared now will have you stay safe as the mercury plunges. Don’t forget to follow us on Facebook because during the winter months, we’ll be sharing winter survival tips, tasty recipes, and other tips on how to make the most of winter.